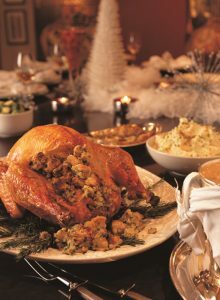 Turkey day is here ….and gone and you just MAY have a few leftovers in your fridge. 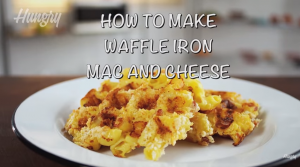 Need some tasty ideas? Don’t worry, I’m here to help! A d’lish Thanksgiving Day feast! Thanksgiving for breakfast – why not! 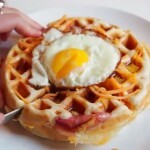 Thanksgiving Benedict is a delicious idea a chef friend shared with me. 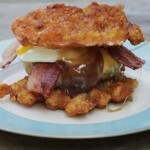 Form leftover stuffing into patties, pan sear, then top with some sliced turkey, a poached egg and a dollop of gravy. YUM! And you know there is never enough gravy left over- right? Why not make some more? Pick that turkey clean (save the meat for soup and sandwiches.) Now it’s time to make a Simple Turkey Gravy. Get out the stock pot. Add in the bones, some chopped carrots, celery and onion. Cover with water (and sometimes I like to add in a carton of chicken broth to give it a flavor boost) bring to a simmer for 2 hours – then strain and voila! Take that extra turkey meat and stock then make a soup. Or make gravy and add some veggies and leftover turkey meat and serve over biscuits for a d’lish open face hot turkey sandwich. 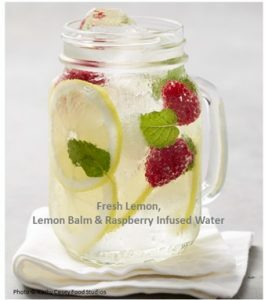 Summertime and refreshment go hand-in-hand, so why not change up the norm and make your own infused waters? We all know you’re supposed to drink at least 8 glasses a day. I know that I struggle with drinking my daily share of water. 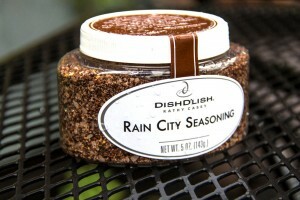 But adding in some d’lish flavors makes it easier and tastier to drink. Let’s make a basic recipe. First, get a large pitcher and add in a sliced fresh lemon, make sure wash the outside first. Then add in some of your favorite seasonal fruits: juicy melon chunk, fresh-picked berries, or a sliced nectarine or peach. Afterwards, the skies the limits with flavors! 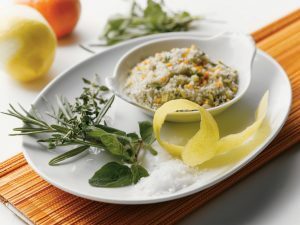 For an herbal note, add in a few basil leaves, a sprig of rosemary, or even a couple of lavender flowers from the garden. I also like to add a teaspoon or so of chia seeds to plump – I love their fun texture! And if you like a touch of sweetness you could add a tiny splash of honey or agave. Now, fill up your pitcher with filtered or spring water. Slightly stir, then cover and refrigerate overnight for all that goodness to infuse. Cauliflower seems to be gaining momentum in the hip veggie arena these days, which is great. It’s so good for you. High in Vitamin K, cauliflower provides us with one of the hallmark anti-inflammatory nutrients. It’s also an excellent source of Vitamin C and low in calories. Gotta love that! It can be boiled, steamed, roasted, pickled, or eaten raw! Although so tasty topped with cheese sauce, there are lots of healthy and amazingly tasty ways to cook up a head of cauliflower. Oven roasting gives it a nice sweetness and a little bit of a nutty flavor. But these days the Cauliflower Steak is all the rage! Cut thick slices from the middle of the head and grill until tender. 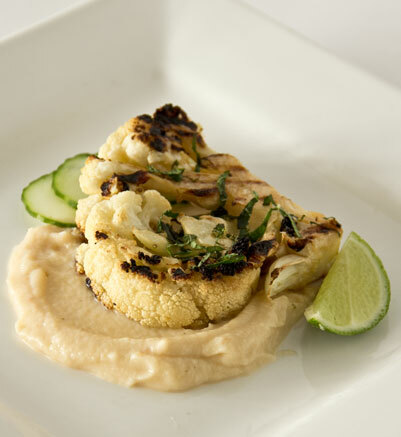 Grilled Cauliflower Steaks with Red Curry Puree. Photo by Kathy Casey Food Studios®. 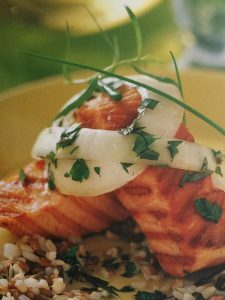 You can cut up the rest of the florets, cook in coconut milk with spices like red curry, ginger and garlic, then blend to make a d’lish puree to serve with your “cauliflower steaks!” Healthy and delicious! And I know the cheddar and cauliflower combo is hard to beat so I whipped up a recipe for a Cauliflower Cheddar Custard! Serve this rich and delicious savory custard next to a tasty steak or a lovely crisp green salad.